David Star Jordan was the founding President of Stanford University, and today's quote shows what I think so many people are missing. Often it is not the wisdom or skill, but the virtue to actually do it. Often we know what is right, but we are afraid to take action because it may make us unpopular, or we are afraid that we will fail by taking that next step. In fact, I often find myself stepping back and thinking about what I should be doing next, only to have to build up the courage to step outside my comfort zone and do it! So, are you capable of showcasing this trio? 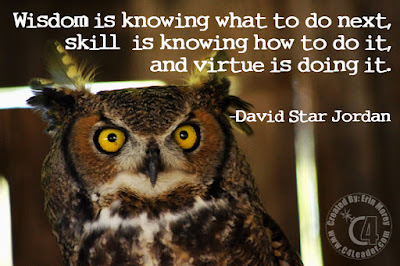 Do you have the Wisdom, Skill, and Virtue?